CAD Manager Column: Trying to decipher the jargon in marketing materials for cloud-based CAD products can be a surreal and confusing experience. But with a little help, it is possible. Have you ever tried to read up on a cloud-related product or service and come away more confused than when you started? Maybe you were thrown by a statement like, “Our product seamlessly spans remote nodes via a robust data replication algorithm,” or “Our cloud topology integrates branch offices via an aggregated, yet distributed, database structure.” If so, you may have crossed over into the Cloud Zone: A place where jargon, acronyms, and nonsensical technobabble combine to create incomprehensible marketingspeak. If you’re like most CAD managers, marketingspeak is not your native language, and cloud technology — or at least the terminology — is new to you. 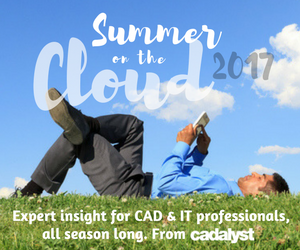 In this edition of the CAD Manager’s Newsletter, I’ll share my strategies for surviving the Cloud Zone and really understanding what you’re reading. Here goes. As with any product or service, marketing materials for cloud-based products exist to make you want to buy that product, right? But in the case of many cloud-based products, marketing materials are also designed to sell integration consulting services provided by the same company. Trying to cover how a product works and all the ways it could be installed can make for complex reading. Sprinkle in some industry-specific acronyms, add a pinch of jargon, and it is easy to understand why so many readers can get lost. In the case of complex-sounding marketing materials, your job as CAD manager will be to decode the marketingspeak into a simple explanation that helps you understand how cloud technology could impact your CAD operations and your company. Understand what the cloud really is. Get a grip on the information technology (IT) involved. Leverage IT-focused websites for research. Apply skeptical, critical thinking when reading. Once you’re able to do these things, the fog will start to lift from the marketing jargon, exposing the true meaning of what you’re reading. Let’s examine each in detail. In simple terms, the cloud is a remotely located workstation, server, or software application that you access via your Internet connection (and which usually belongs to someone else). Not so complicated when you think about it in those terms, is it? So what’s the core difference between a cloud-based product and a non-cloud-based product? The answer is the speed of the Internet connection your office has, because that has everything to do with how quickly any cloud-based product will perform. Simply put, the speed of your Internet connection describes how rapidly a file can be downloaded from or sent to a cloud resource. Understanding this simple definition of the cloud allows you to realize that any cloud resource will only be as good as the speed of your Internet connection. If you have a super-fast Internet connection, your cloud product will perform well, but if you’re in a construction trailer in the middle of a sugar plantation in Brazil, the same product can be unworkably slow. Using the speed concepts introduced above, you can begin to understand that evaluating a cloud product or service is largely about knowing how much data is moving between your users and the cloud. For example, you’ll now realize that when marketing materials for a cloud product refer to “sharing data between branch offices,” that means it will require high-speed Internet to work well. In fact, for CAD managers, the idea of running CAD software that operates on files stored on a network server is a really old concept. All that the cloud really does is move the software, files, and server away from you to a remote location you access via the Internet — thus making the speed of your connection the most important variable. This means that cloud-based CAD really isn’t a CAD problem, it is an IT problem! Therefore, the action items for most CAD managers are to become more IT-aware and to involve your IT department as you investigate any sort of cloud-based CAD tools. Of course, there are a vast number of websites that provide information on cloud technology, but I’ve found CNET and Spiceworks to be invaluable. CNET is a well-indexed general IT site that you can search to learn about all manner of IT tools and terminology. Whenever I encounter terms or technobabble I don’t understand, I head to CNET to read up. Over time, you’ll build a solid cloud vocabulary so you can decode cloud marketing materials with ease. Spiceworks is a free membership community that puts you in touch with thousands of other IT and CAD management professionals who support IT. I’ve found Spiceworks to be a fantastic resource for unbiased reviews, and one of the few places you can find both IT and CAD people who are willing to assist each other with cloud-based tool support. Focusing on Internet and IT issues. It seems like it is never the CAD part of cloud-based CAD that confuses me or causes crises in an installation — it is always the IT part. Expanding my IT vocabulary and skill set. By using web resources and peer groups, I’m able to learn new terminology and expand my IT knowledge gradually. It’s really like using a dictionary: whenever you encounter a term you don’t understand, go look it up. As time goes by, you’ll learn a lot. Always ask questions and think for yourself. A healthy skepticism about any new technology — not just the cloud — is a good thing. By educating yourself, touching base with other users via Spiceworks, and asking cloud product vendors pointed questions, you should be able to understand what you’re reading. Should you find yourself confused in the Cloud Zone, I hope these strategies for deciphering cloud marketingspeak will help you, just as they’ve helped me. While you may not understand the Cloud Zone immediately, the good news is that with a little homework and some critical thinking, you will. Until next time. What are your thoughts on cloud-based CAD? Please email me your thoughts at rgreen@cad-manager.com and look for your feedback in a future installment. The biggest distinction is if the files are stored remotely, or if the "cloud" system you are being sold just replicates them on multiple company servers, so its really not cloud at all. I would not even consider full remote (true cloud) systems at this point, as the speed would kill you.